I like to eat. I enjoy food. I get to travel. Need I say more? Wanderlust Series: No destinations; No Restrains; No Limits. Reds on the River, Rockford, Michigan – Do You Know Where Rockford Is? A business trip landed me at Reds on the River, in Rockford, Michigan, on a Monday afternoon at 4pm looking for lunch. Do you know where Rockford is? It has a population under 6k. Reds is the favorite restaurant of the gentleman who heads my company’s Contact Center. This is also the place where the company’s President’s Award would take place. The President’s Award celebrates the top agents and supervisors in the Call Center. The restaurant is upscale, contemporary and serves modern American cuisine. 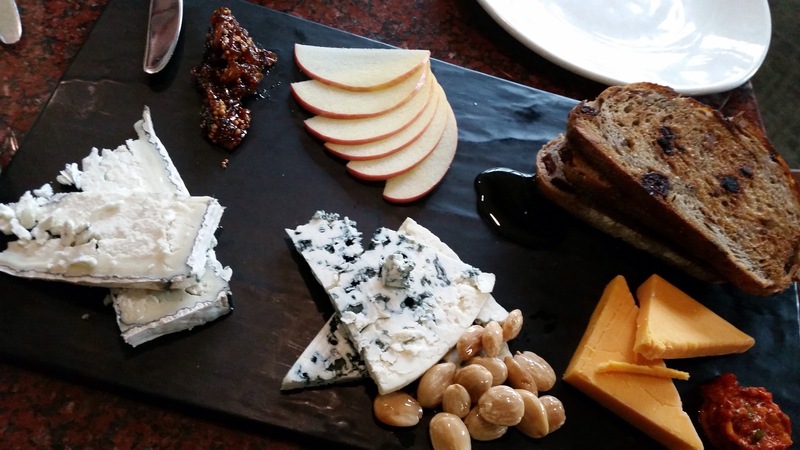 Artisan Midwest Cheese Plate: Three unique styles with traditional accoutrements. We were so hungry when we arrived that everything tasted fantastic. The goat cheese on far left was excellent. The cheddar on right was pedestrian. I still couldn’t figure out the what the beige nuts at bottom are – almonds? 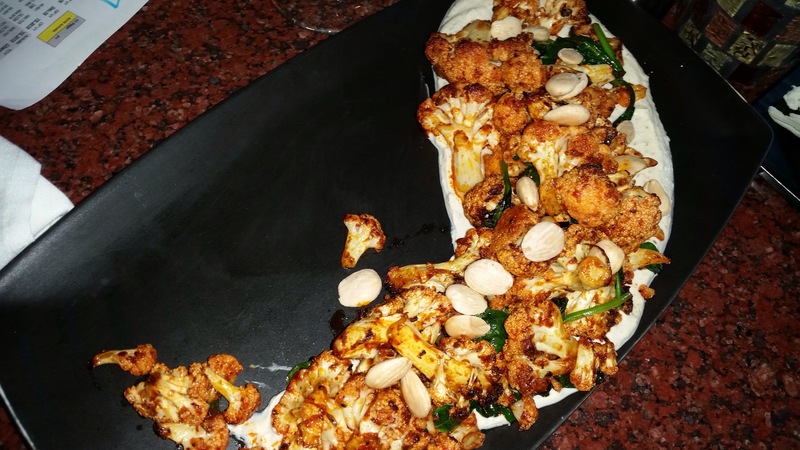 Roasted Moroccan Cauliflower: Spinach, Marcona Almonds, Cumin Yogurt, Harissa Butter, Golden Raisins. This has the making of a happy Moroccan dish with cumin and harissa. The misstep comes from the yogurt. There was too much of it on the plate and softened up the roasted cauliflowers. 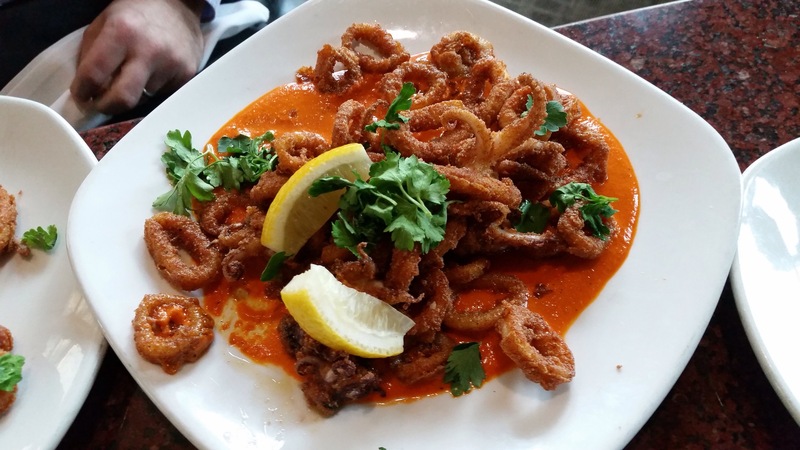 Calamari Fritti: Romesco Sauce and Lemon. My colleagues loved this. I had a slightly different opinion – I think they should have gone light on the Romesco sauce. 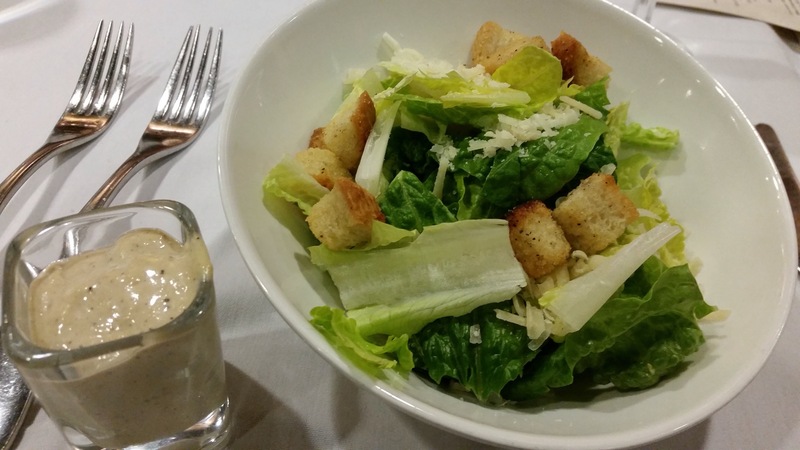 Caesar Salad: Romaine, Garlic Croutons, Parmesan Reggiano. 8 oz. 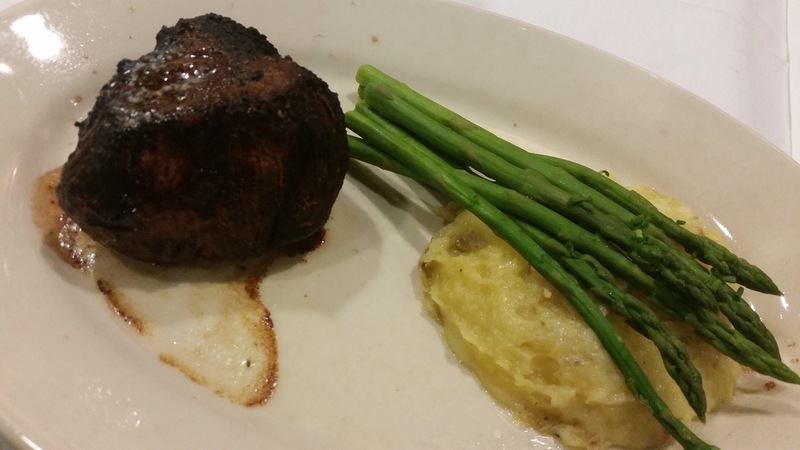 Filet Mignon with asparagus and mashed potatoes. Excellent! Other than the minor issue of not exactly firing to the right temp. This seems to be the downfall of many restaurants. However, Reds were serving over 27 of us and I imagined that makes the temp control even more challenging. In summary, I think Reds on the River is on par with those in the NYC which makes it more amazing since it is in Rockford, an hour north of Grand Rapids, Michigan. Do you know where Grand Rapids is? 🙂 Grand Rapids has a population under 200k. Although it’s hard for a New Yorker to wrap her head around towns and cities with such low population, I thoroughly enjoyed spending some freezing February days in Michigan and dinner at Reds. Posted on February 28, 2016 February 27, 2016 Categories American, Cuisines, My TravelsTags American cuisine Rockford MI, Reds on the River Rockford MI, Rockford MI restaurants, Rockford MichiganLeave a comment on Reds on the River, Rockford, Michigan – Do You Know Where Rockford Is?